A ripe coffee cherry cut in half. Typical cherries (such as this one) each have two beans, though peaberry coffees only have one bean per cherry. All that red-pink fruit has to pulped and the coffee seed dried before it can be roasted. Once a coffee cherry has been picked, it must be processed in order to become a green coffee bean ready for roasting. Coffee can be either wet or dry processed, and there is also a more recent hybrid process known as semi-dry. Dry process is the oldest method of processing coffee and is the preferred method for most of the Arabica from Ethiopia and Brazil and almost all Robusta worldwide. Harvested cherries are dried on patios or tables for about four weeks, after which they are sent to a mill to be hulled in one step. This process can impart defect flavors due to inadequate hand sorting, uneven drying, and fungal and bacterial growth. However, dry process coffees can also have better body and lower acidity, with more fruit flavor. 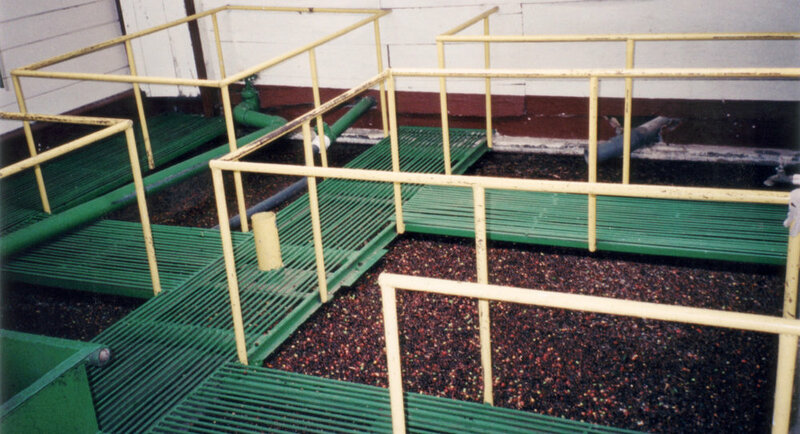 Wet process or washed coffee requires machinery and water, and is therefore the more expensive technique. Harvested cherries are sorted by being dumped into water: good cherries sink, while bad or unripe ones float to the surface and can be skimmed off. The skin and some pulp is then removed by pressing the cherries through a screen. The rest of the pulp is removed by allowing the remaining fruit (but not the seed itself, which is still protected be a layer of parchment) to ferment for a day or a day and a half, and then washing the rest of the pulp away. After this, the beans are laid out on a patio (sound familiar?) to dry to about 10% moisture. Wet processing produces a brighter, cleaner flavor. Separation vats for wet processing. In semi-dry or wet-hulled processing, beans are pulped, but not fermented in water. Instead, they are stored for a day in their own mucilage and then washed. This is the preferred method in Sumatra, Flores, Sulawesi, and Papua New Guinea. So the next time I tell you we have a washed Yirgacheffe in store, you know what I mean. By the way, we have a washed Yirgacheffe in store.